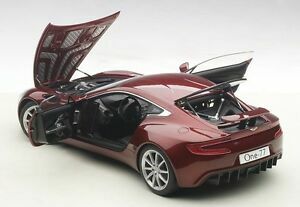 AUTOART ASTON MARTIN ONE-77 DIAVOLO RED 1:18 ALMOST SOLD OUT*New Item! zilvladimi has no other items for sale. Details about Autoart ASTON MARTIN ONE-77 DIAVOLO RED in 1/18 Scale. New Release! In Stock! Autoart ASTON MARTIN ONE-77 DIAVOLO RED in 1/18 Scale. New Release! In Stock!